It’s one of the biggest programs of the season, headlined by the Pepsi North America Cup on Saturday, June 15. There is so much material to accompany analysis of the races on the Mohawk Raceway program that night that we have split the difference with the usual two blogs—here and our Hambletonian Trail blog—and added a special North America Cup blog that will appear at this site on June 14. 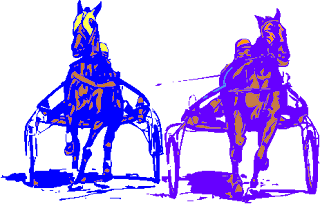 The Elegant Image and Goodtimes finals are both at the Hambletonian Trail while here we will deal with the Armbro Flight, Fan Hanover, Mohawk Gold Cup and races 4 through 7 on the program where there is a $100,000 guaranteed Pick 4 that includes a 20-percent bonus for all TwinSpires players hitting the combo. And there is a $100,000 guaranteed Pick 4 covering races four through seven at Mohawk on Cup night. TwinSpires players hitting it get a 20-percent bonus. See our H2W list under Mohawk for our suggestions. Let’s not forget June 14 at Harrah’s Philadelphia where more glamour-boy pacers roll for big dount in Pennsylvania Sires Stakes action. This field should be the same bunch of gals fighting for a few big purses all season. The division has four-and-up mares and so far the youngest have been best. Take Maven, who was a major soph winner and one of this event’s elim winners. She looked smooth and strong coming down the stretch last week and will be ready for a shot at the $271,470 on this line here. Both elims were won with closers and the best staying speed came from 10-1 Intense America. Maven got to her but she was tough holding on for second as Bax Of Life came from out of the clouds late. “America” gets the rail and should be on top in this slow-to-start bunch. At odds that could be as high as last week she could upset with a front-trotting, fraction-controlling engine drive as long as she keeps from dueling with China Pearls. Here are three-year-old fillies pacing for $391,882 in Canadian coin, a lot of them carrying over their jousts with gals they met as freshmen. The single elim’s ending last week may be repeated this event, as I Luv The Nitelife returned to her frosh self and was all out in a wire to wire effort. It is hard to say who can match her in this field, since Belle Boyd is certainly the second best and all results point to those two at the finish line. In fact, Belle Boyd raced a tougher mile, so if you care to box those two it would not be out of the question to see “Nitelife” cuffed late or even somewhere down the stretch. Other than those two, only Love Canal showed anything, with a closing kick that got her third but that move may just repeat the trifecta here. Don’t expect State Treasurer to repeat the Molson Pace mile because on the two-turns at Mohawk on Cup night, the $100,000 Mohawk Gold Cup should belong to Fred And Ginger. Followers of our blog know that we gave the elder pacer a great report at the beginning of the season and nailed that big exacta with him at 10-1 beating Hurrikane Kingcole on May 11. Since then “Fred” came off a hot pace and won in a sizzler but has not been able to bring home a price near 10-1. Here is the perfect spot for Fred to hide up close while State Treasurer, Ok Commander and Up The Credit shuffle for position and burn out from the efforts. And while Warrawee Needy has to once again be hurled wide to brush into contention, Fred will be full of himself with energy to spare coming to the wire. “Warrawee” may make for a good exacta with Fred since he must negotiate his moves from post 9. Three PASS miles for soph-colt pacers, each worth more than $79,000, go to post on June 14 at Harrah’s Philadelphia. In episode one we are sticking with Bigrisk, as he improves on the circuit and could be ready to fire big soon. Then, in PASS round two, Lonewolf Currier should adore getting onto this track after four-turns misery struck him with post and trip. In the nightcap, Our Dragon King could repeat but not at 15-1. We always seem to go with him when he is a huge overlay. Perhaps in this field he will be an overlay at 2-1, since it is not a powerhouse bunch.